The Rev. Al Sharpton took to the pulpit at Parkside United Methodist Church in Camden on Sunday, Dec. 11, 2016, encouraging the congregation to overcome personal adversities. 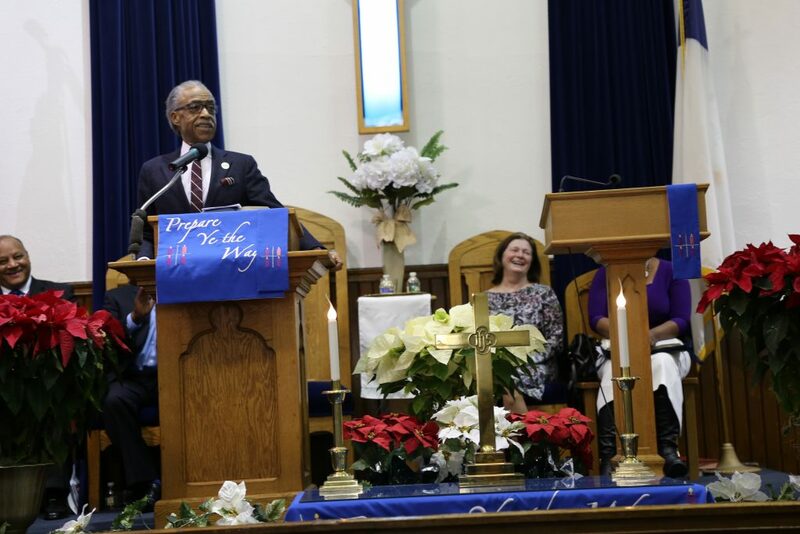 Sharpton, 62, a Brooklyn native and iconic outspoken civil rights activist best known for boisterous preaching, addressed approximately 400 at the 102-year-old church on Kaighns Ave on the third Sunday of Advent. A special performance by the “Vessels for Christ” dance ministry preceded the message. Joined on the altar by Parkside UMC’s Senior Pastor, Rev. Keith D. Dickens, and Gateway South District Superintendent, Rev. Myrna Bethke, Sharpton pivoted the message off of politics and on to spirituality. At age four, Sharpton began proclaiming the gospel. He went on to become a Baptist minister, a nationally renowned social justice leader, and host of MSNBC’s PoliticsNation. At Parkside, he promoted his “We Shall Not Be Moved” march for civil rights, scheduled for Jan. 14, 2017, in Washington, D.C., two days before the late Rev. Dr. Martin Luther King Jr.’s birthday. Months prior, Dickens emailed Sharpton inviting him to preach at Parkside. To his surprise, Sharpton replied and accepted the offer. “The Bible is all about triumphs and tragedies; victories and defeats,” Sharpton preached, mentioning how on election night he watched the results with several people who were setting themselves up for White House positions in what they hoped would be Hillary Clinton’s administration. “They were all talking about what they were going to do for themselves, not what they were going to do for others,” he said, describing a moment of moving revelation. Sharpton repeatedly invoked Psalm 37, which according to The Message translation says in verses 5-6 to “open up before God, keep nothing back, He’ll do whatever needs to be done.” He challenged the congregation, asking them what they were going to do to defend those who are righteous. “If you do what God has told you to do, He will bless you,” said Sharpton. “Whatever mistakes you made in life has made your stronger.” He went to say that Christians ought to get back up after they stumble.